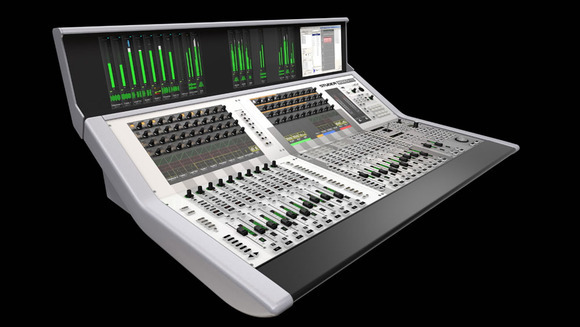 POTTERS BAR, United Kingdom – HARMAN’s Studer is extending its popular Vista 5 M2 range of digital broadcast and production consoles to include a 22-fader option, realising the lowest cost Vista ever to be made available and accompanying it with a new low-cost, Compact Stagebox. Like its bigger brothers the 32 and 42 fader versions, the new model is optionally equipped with new TFT metering, capable of displaying signal levels from mono through to 5.1 channels on each input, with a configurable lower area which can be used to display bus assignments, surround images or the unique ‘History Mode’, where a scrolling audio waveform displays signal anomalies and highlights them for up to 50 seconds to allow the engineer to identify where the event occurred. Metering for ‘layer 2’ signals can also be viewed, while the Control Bay screen can be used to provide configurable user pages with up to 40 meters. When the TFT meter bridge is fitted, the external GC screen becomes an integral part of the chassis. The Vista 5 family has found its home in all kinds of broadcast and theatre production facilities around the world. Existing Vista 5 owners will be pleased to learn that their console may be easily upgraded to the M2 version to be ready for the optional meter bridge, which is a simple add-on to the console chassis. To provide a cost-effective package with the 22-fader console, Studer is also introducing the optional Compact Stagebox, which offers a high density of I/O connections in only 4U of rack space. The modular unit is fully configurable but is offered with a standard configuration of 32 mic/line inputs and 16 line outputs. Optionally, the Compact Stagebox can be equipped with an additional 16 mic/line input module instead of the output module, then providing 48 inputs. Alternatively, up to three output modules resulting in 48 outputs may be fitted. The expansion slots for standard Studer D21m I/O cards may be used for interfaces connecting to most popular digital formats, including CobraNet® or Aviom A-Net® 16, Ethersound, ADAT, TDIF, SDI (SD/HD/3G), Dolby® E and Dolby Digital. A MADI recording interface can be fitted to the expansion slots as well. The Compact Stagebox is connected to the host console using either Cat5 or optical-fibre MADI, the same way as the larger 64 mic/line Stagebox is hooked up, and shares the same redundant MADI cable capability. The unit comes complete with twin redundant power supplies, thermostatically-controlled fan cooling and full LED status monitoring. An 8ch GPIO interface is also provided.